Members and ambassadors of the Fayette County Chamber of Commerce gathered at 138 S. Fayette St. in Washington Court House to welcome Key Realty with a celebratory ribbon cutting. This office was made possible through the work of the various members of the team and renovations by Angela Williams-Gebhardt. 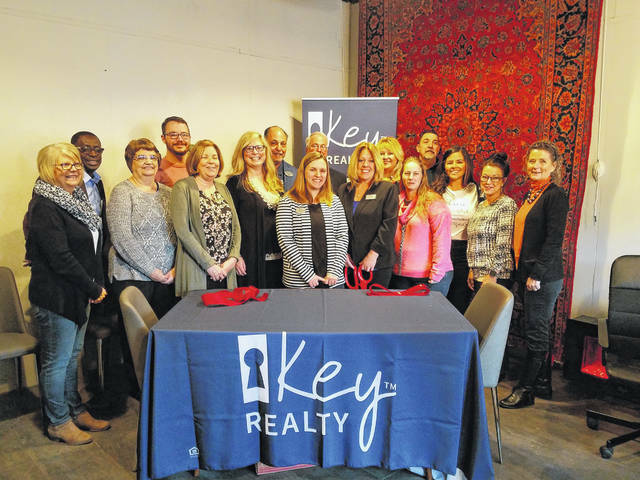 The Fayette County Chamber of Commerce welcomed Key Realty to its membership on Monday with a celebratory ribbon cutting and announced the upcoming Business After Hours event hosted at the location. Chamber members and ambassadors gathered at 138 S. Fayette St. in Washington Court House to welcome Key Realty. This office was made possible through the work of the various members of the team and renovations by Angela Williams-Gebhardt on the building. The office will occupy one area of the building while the other is currently occupied by Lily Home & Garden. Key Realty, in partnership with Lily Home & Garden, will be the February Business After Hours hosts. This event will take place Wednesday, Feb. 20 from 4:30-6:30 p.m. and will feature both chamber business members. “They have done a beautiful job restoring the former ‘Record-Herald’ building and I am excited for our community to see their restoration work, as well as the items Lily Home and Garden has for sale during our Business After Hours” said Julie Bolender, chamber president. Williams-Gebhardt said the event will feature a mini-menu that will also come to a local restaurant here in Washington Court House. The menu will include beef, chicken, potatoes, salad, dessert and a full bar. During the event, the hosts will give tours of the building and the upstairs apartments. Williams-Gebhardt also said she wants to see the downtown area become more similar to the Short North in Columbus, featuring more varieties of food, more boutiques for shopping, and interesting buildings for people coming through the community to enjoy. For more information visit the facility at 138 S. Fayette Street in Washington Court House. The information in this article was provided by Angela Williams-Gebhardt and Fayette County Chamber of Commerce President Julie Bolender. https://www.recordherald.com/wp-content/uploads/sites/27/2019/02/web1_20190211_110800.jpgMembers and ambassadors of the Fayette County Chamber of Commerce gathered at 138 S. Fayette St. in Washington Court House to welcome Key Realty with a celebratory ribbon cutting. This office was made possible through the work of the various members of the team and renovations by Angela Williams-Gebhardt.